Yahoo: Tessera announced that it has licensed its OptiML Focus enhancement solution to Samsung Electronics. The OptiML Focus solution enables all objects in an image to be in focus simultaneously, from 20cms to infinity, with no mechanical parts. It integrates lens design with compact digital algorithms that when combined, result in an image which is always in focus. Digitimes updated its article on SETI. The newly added paragraph at the end tells that although SETI received investment from Dongbu in 2007, Dongbu noted that on May 23 of this year, it issued a filing with the Korean Stock Market indicating that the company had decided to not to invest in the camera module business with SETI and withdraw its previous investment. This withdrawal might open a way for Hynix to cooperate with SETI. It almost looks like Digitimes added this paragraph in response to comments to the previous post on the same matter. Seeking Alpha published Micron quarterly conference call transcript. Not that much was told about image sensors business. ...image business migrating more toward the higher-end pixel density and obviously was through May and I think as we move throughout this fall, the second half will probably be dominated by 3 meg. And we were well positioned in that space and currently that business bottomed really a couple of quarters ago and if you notice our results compared to some others, we've continued on a pretty good path of recovering you know where I think we had lost for a couple of other reasons out of the marketplace historically. So that's actually going pretty well. And we know what our targets are for that business and as we've noted before we're exploring with potential partners how we can achieve those targets. And I would just say that we hope to accomplish or I suppose another way of saying it is complete something sometime in this quarter in terms of separation. How much of your image sensor business is 3 megapixel and above? We just reviewed that data before the call. It's more than 50%. And to which end markets are you selling handsets versus digital cameras? The majority of the revenue's going to handsets. That's correct. So are you seeing any trend there in digital cameras, your image sensors are replacing CCDs or is that domain pretty much left to CCDs? No, we have selectively won a couple of camera designs away from the CCD makers. That's the 8/9 megapixel area so I certainly would not suggest that today CMOS sensors are taking over CCDs in the DSC space, Digital Still Camera space, but we have I don't know between five and 10 active projects underway in the digital still camera area with our CMOS sensors. Yahoo: Micron announced results of operations for the company’s third quarter of fiscal 2008, which ended May 29, 2008. Sales of CMOS image sensors in Q3 FY2008 increased 27% compared to the second quarter and represented 11% of the company’s total sales in Q3. The company’s gross margin on sales of imaging products improved to 35% in the third quarter compared to 24% in the second quarter, reflecting a greater mix of higher megapixel sensors. Sony published its midterm Corporate Strategy update for 2008-2010. It intends to invest approximately 900 billion yen towards strengthening core focus areas within components and semiconductors, explicitly mentioning image sensors as one of the main investment targets. Sony is also promoting the concept of “open innovation”, whereby it is looking not only inside the company, but outside for technologies that foster innovation. By combing Sony’s technological strengths with external expertise, it aims to accelerate R&D efficiency and respond to changing customer needs. Digitimes writes that Hynix intends to partner with SETI on image sensor deployment. If not a typo, this is quite unexpected move to me. SETI was born as image sensor arm of Dongbu and it heavily relies on Dongbu in its everyday activity. Hynix cooperation might mean some sort of alliance and technology transfer from Dongbu to Hynix. I can understand why Hynix needs this, but I do not see Dongbu's benefits from such alliance. In the meantime SETI cut its ASP for VGA sensors to below US$1 (US$0.7-0.8), posing a threat to Omnivision, according to Digitimes sources. The sources indicated that SETI has been aggressive in its deployment in the China handset market, cutting its VGA sensor ASPs sharply. With customer feedback being good, leading players such as Omnivision have been affected, as most VGA sensors are still quoted above US$1, at US$1.3-1.4. Dongbu formally launched an aggressive program to serve Chinese mobile handset OEMs last July when it established a Shenzhen sales subsidiary and simultaneously entered into a strategic partnership with China based HNT, a camera module manufacturer. The solid ties between SETI and Dongbu is a major reason to support such a price reduction, the sources said. Digitimes: Over the past several years, Aptina and OmniVision have had clear segments of focus, with the former targeting mainstream and high-end segments and the latter mainstream and entry-level. Sources at Aptina indicated that ASPs of Aptina's CMOS image sensors are always higher than its competitors'. Conversely OmniVision usually aims to reach shipments of a certain level before exploring the high-end segment. Digitimes sources observed that both players have begun adjusting their sales strategies recently. Aptina is aggressively selling its CMOS image sensors to all segments in an attempt to regain its throne in the industry. OmniVision, on the other hand, is also being aggressive to advance its technology. Yahoo: Frost & Sullivan holds its 2008 Quarterly Analyst Briefing Presentation on the North American CMOS sensors market on June 26, 2008. This briefing will benefit image sensor manufacturers, system integrators, and manufacturers of consumer and industrial products, including cell phones, medical devices, automotive safety systems, and industrial security systems in all geographic regions. Digitimes: Tessera says that active customer engagement with its Wafer Level Camera (WLC) is already underway. Digitimes sources at camera makers estimated that a traditional VGA resolution camera costs about US$0.50, whereas Tessera's WLC costs about US$0.20. Executives from Tessera noted in saying that a WLC module costs only US$1, versus US$1.80-2 for a traditional module. Yahoo: Kodak announced Imaging Technology which combines features developed for Kodak's Easyshere Digital Cameras, enabling mobile devices with comparable imaging quality to what one would expect from a consumer digital camera. It includes Smart Capture technology, which automatically adjusts and determines camera settings in any environment, and KODAK PERFECT TOUCH Technology, which generates brighter, more vivid pictures, help ensure the best quality for each image captured. In addition, a seamless connection to Kodak's vast ecosystem of products and services - KODAK EASYSHARE Software, KODAK Gallery, KODAK All- in-One Inkjet Printers, KODAK Picture Kiosks and KODAK Digital Frames - provides a variety of ways to edit, organize, share and enjoy pictures. KODAK Imaging Technology works in conjunction with KODAK Image Sensors, as well as sensors from other leading manufacturers, providing flexibility to manufacturers. Simultaneously Motorola announced MOTOZINE ZN5, a 5MP camera phone based on the Kodak technology. Motorola announcement does not mention the manufacturer of this 5MP sensor. Yahoo: Pixelplus obtained a completely positive ruling in the patent infringement proceedings from the Seoul Central District Court on three disputed process patents claimed by MagnaChip. Since April 2006, Pixelplus has obtained completely positive rulings or results in the patent infringement proceedings on all of the seven disputed patents claimed by MagnaChip in Seoul Central District Court. Separately, in March 2008, Pixelplus obtained a completely favorable ruling in the patent infringement proceedings on the disputed color filter patent claimed by MagnaChip in Seoul High Court. With this ruling the few years old patent saga between Magnachip and Pixelplus has finally come to end (unless Magnachip appeals). Telecoms Korea tells that Hynix is expected to participate in Siliconfile's management as the largest shareholder, as Hynix said in a regulatory filing. "We plan to aid the company (Siliconfile) to rise as a leading player in the global image sensor market," Hynix said in a statement. Solid State Technology also has an article on the investment, mostly repeating other news sources. CMOSIS published a presentation on global shutter techniques. It was presented on Vision Show 2008 by CMOSIS CEO Guy Meynants. Guy compares different ways to make global shutter and to extend DR of sensors with global shutter. The presentation is very educational, thanks for publishing it! EETimes explaines the advantages of Scalado technology, being licensed by Aptina and Omnivision and becoming a part of Symbian platform. According to Scalado, Scalado CAPS imaging solution is already in more than 150 million handsets. But to take full advantage of its capability, CAPS should link a handset's processor with Scalado's camera solution which is made by means of SpeedTags. Scalado is projecting such camera phones to emerge "toward the middle of next year." Yahoo: Synopsys announced that Kodak has adopted Synopsys' TCAD Sentaurus to support its small pixel development. It sounds like Kodak uses process, device and optics simulation components of Sentaurus, both 2D and 3D, even though this is not clearly stated in the PR. Hynix kept a low profile for half a year or so after proclaiming Siliconfile to be its image sensor partner. Today Trading Markets reports that Hynix board has agreed to buy a 30% stake in SiliconFile for about 8.16 billion won ($7.9 million). Hynix said it will buy an initial 15% stake in KOSDAQ-listed SiliconFile and will acquire another 15 percent over time. "We have decided to expand our strategic alliance, encompassing all the functions from development to production to marketing, which should maximize the strength of each company," Hynix said in a statement. Siliconfile had quite successful 2007 year, but it seems to be unable to keep pace with pixel shrink. In theory, alliance with a strong foundry partner should help its advance to smaller pixels. However, as a novice in image sensor production, Hynix probably needs more time to develop a competitive CIS process. I'm sceptical that such an alliance would propel any of them to market leaders. Not in near future, at least. A 1.25-inch optical format, 8.9M-pixel CMOS image sensor that employs a 4T pinned photodiode (P-PD) pixel and 14bit column ADCs is reported. A 14bit or 12bit digital video signal is streamed out via 16-lane low-voltage, low-power differential serial output ports in 50fps and 60fps operations, respectively. Temporal noise floor of 2.8e-rms and linear full-well of 27.8ke- were obtained at 60 fps operation. Row temporal noise and column FPN are as small as 0.31 e-rms and 0.36 e-rms, respectively. 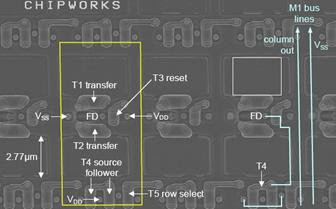 New Global Shutter CMOS Imager with 2 Transistors per Pixel. We present a new global shutter CMOS imager with 2 transistors per pixel. The first transistor is a ring gate transistor for accumulating holes that modulate threshold voltage. The second one is a transfer gate transistor that transfers holes from a PD to the ring gate transistor at the same time in all pixels. Simple structure allows us to realize 5.4um pixel pitch, kTC noise free, and global shutter sensor using 0.35um technology. Yahoo: Aptina's MT9E501 was designed to support UHDTV standards as defined by SMPTE standard 2036-1. The sensor is being used in NHK's prototype cameras for the 1920 x 1080 HD format and the next generation 7680 x 4320 Super High Vision broadcasting system with sensor's native resolution of 4112 x 2168. The 8.9MP/1.25-inch optical format sensor delivers 60fps at at 4K format of 3840 x 2160. It has a 16-channel SLVS differential output to reach this speed. A paper on the sensor is being presented at the Symposia on VLSI Technology and Circuits which is being held June 17-20, 2008. Yahoo: Pixelplus reported its results for Q4'2007 and Q1'2008. The company stated quarterly losses and sluggish sales in both quarters. Pixelplus sold about 11.6M image sensors in 2007 and "provided over 19.0 million image sensors arising from its supply of services to this Japanese module maker in fiscal 2007". In Q1'08 the company sold 4.3M image sensors and "provided approximately 1.1 million image sensors arising from its supply of services to a leading Japanese module maker". Yahoo: New Magnachip VGA sensor is claimed to have high quantum efficiency and low read noise enable SNR that is over 15 dB better than the performance available for typical sensors in the market today. The PR enphasizes that MC502ER sensor is implemented in 0.13um Magnachip's process, probably to differentiate it from Dongbu-made VGA sensors that Magnachip is also selling. No word on the sensor's pixel size or optical format is given in PR. The MC502ER is planned to be in mass production in Q3 of 2008. Don Scansen posts his view on the recent Sony and Omnivision BSI announcements and how they changed the industry landscape. I fully agree with Don that these are very important announcements. However, I'd like to see BSI sensors in mass production and really competing for the market place. Before this happens the announcements are merely technological statements that some works are being done in BSI direction. Digitimes: Tessera syas that the cost of Wafer-Level-Camera technology (WLC) is 30% lower than that of conventional camera technology. Though concrete cost difference figures are unavailable because customers have not yet moved into volume production, Tessera stressed that the ASP of WLC components will be lower than that of conventional solutions. Regarding the resolution of Tessera's OptiML WLCs, Tessera executives said its technology allows for scaling to multi-megapixel resolutions. Tessera WLC licensing fees cover all packaging, component, equipment and testing aspects related to production. Royalty payments are made to Tessera after start of production. EDN published a nice aricle on evolution of pixel design from 3T to 4T to shared pixels and beyond. The article is written by Assaf Lahav and Amos Fenigstein, two pixel design experts from Tower Semicoductor foundry. It covers many aspects of pixel design and describes the logic behind pixel archtectural evolution, all in easy to read manner. Chipworks blog has an interesting post about Sony's latest pixel generation, also mentioning just announced BSI pixels. The article shows a page from Sony's presentation claiming it leads the industry in 1.4um pixel mass production. 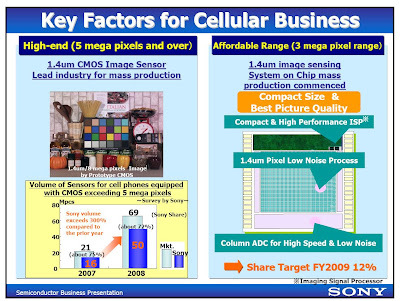 The presentation says that Sony's 3MP 1.4um pixel SoC sensor is in mass production now. Update, Sep. 16, 2008: The presentation mentioned above is from Sony site, dated by Feb 2008. It claims that Sony holds 75% of 5MP and higher image sensor market. The slide from the presentation shows Sony plans and also 3MP SOC with 1.4um pixels. Sony announced development of 5MP backside illuminated sensor with 1.75um pixels. It's claimed to have nearly twice higher sensitivity and lower noise. The new sensor achieves SNR of +8dB(+6dB sensitivity, -2dB noise) in comparison to existing Sony CMOS image sensors of the same pixel size. The BSI sensor retains 60fps speed that it achieved in its latest sensor's generation. Compared to conventional front-illuminated structures, back-illuminated structures commonly causes problems such as noise, dark current, defective pixels and color mixture that lead to image degradation and also cause a decrease in the SNR. To overcome this Sony developed a new photo-diode structure and on-chip lens optimized for back-illuminated structures. Additionally, Sony's high-precision alignment have addressed color mixture problems. Yahoo: Omnivision announced 1/4" 3MP sensor with Qualcomm's MDDI interface, designed to optimize partitioning with Qualcomm's chipsets. The new OV3647 uses 1.75um pixels and is capable of operating at up to 15fps in full resolution. The OV3647 fits in 7 x 7 x 5 mm camera modules with a very short optical track, and thus is versatile enough to work well both with fixed focus and auto-focus modules. The OV3647's embedded, one time programmable (OTP) memory is designed for part recognition and simplification of module designs using different lenses. Digitimes also reports that Omnivision vice president of sales Ray Cisneros has said digestion of CMOS image sensor inventory at customers is almost complete and demand from handset customers is also recovering. Cisneros said current inventory levels have resumed to a healthy level. Sales prospects for CMOS image sensors are anticipated to improve in the second half of 2008. EETAsia: Princeton Lightwave Inc. (PLI) and Nextreme Thermal Solutions Inc. have agreed to co-develop a SWIR focal plane sensor using Nextreme's thermoelectric cooling bumps. The two companies are working on integrating thin-film thermoelectric cooling bumps with InGaAs focal plane arrays to dramatically reduce power consumption and weight, and improve overall performance. e2v has developed a new, high QE (>80%), CMOS sensor technology. The new custom sensors generation also features a low-noise, full-frame global shuttering scheme. This technology is particularly suited to performance-driven markets, such as surveillance, homeland security, Automotive Driver Active Safety (ADAS) applications, industrial machine vision including barcode reading, professional DSLRs and broadcast/cinematography cameras and deep UV inspection systems for the semiconductor industry. Further improvements in signal to noise ratio in the global shutter architecture are planned for future standard products built on the high sensitivity platform. Video/Imaging Design Line: Alps announced industry’s smallest VGA camera module (5.0mm wide x 5.0mm deep x 2.2mm high) with F2.8 lens. Once wafer level camera modules reach the market, today's 2.2mm thickness would look quite a lot. But now Alps certainly has a reason to be proud of its achievement. Aptina announced that it will integrate Scalado SpeedTags technology into future mobile 3MP and above multi-megapixel SOC designs. Scalado technology assists in managing the larger files produced by the high resolution image sensor improving overall JPEG image handling performance within CPU restrictions of mobile phone. There is not that much known about SpeedTags. Probably it's a set of special hardware hooks to accelerate subroutines from Scalado CAPS imaging SDK. About a year ago Omnivision made a similar announcement. So by now the two world's biggest CMOS sensor vendors support Scalado. The word is that Nokia, Samsung and Sony Ericsson develop camera phone applications using Scalado CAPS. EETimes: Magnachip "is putting the finishing touches on its turnaround strategy", including "a major comeback in the CMOS image sensor business". MagnaChip's CMOS image sensor sales were about $85M in 2007, which ranked them as the world's ninth largest supplier in the area, says Robert Lineback, an analyst with IC Insights Inc. "MagnaChip was well up in the top-5 in the rankings until a few years ago, but they stumbled in the mega-pixel class and above products," he said. "MagnaChip has seen some improvements from its weakening position in 2006, but it still faces stiff, growing competition from the likes of Sony and Samsung, along with OmniVision, which has regained its foothold and took back the top spot in CMOS image sensors in 2007," Lineback said. As part of its comeback strategy, MagnaChip recently launched a 2.2um, 1/10-inch VGA CMOS image sensor for use in slim mobile phones. In about the same time its major competitors announce 1.4um pixel generation. I wonder how Magnachip can seriously talk about the comeback while being two generations behind the others?